In Judeo-Christian religions, the Ten Commandments are generally regarded to be of elevated importance (or, at least, are better known than many of the other rules). For Jews, Protestants, and Catholics, the ten rules are generally the same, but there are some slight differences mostly when it comes to enumeration. For example — and you can see a breakdown of the commandments here — in both Judaism and Protestantism, the seventh commandment is “thou shalt not commit adultery,” but that’s the sixth commandment in Catholicism. So if you pick up a Bible and see that the numbering isn’t what you’re familiar with (if you’re familiar with the numbering in the first place), that’s why. But in general, the words are going to be roughly the same thing. Except for this one bible printed in 1631. That one got the sixth/seventh commandment, well, wrong. Check out the picture below. See the word “not” on the highlighted line? No? That’s because — oops! — it’s not there. 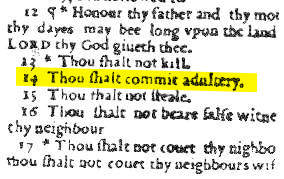 The commandment reads: “Thou shalt commit adultery.” And again, that’s a commandment, not a mere suggestion. About 1,000 of the bibles were printed and they were ordered to be destroyed — burned — and those that had already been distributed were recalled as best as possible given the restraints of the era and, for that matter, the error. There are now only about a dozen of the books known to be in existence. The forced scarcity created by the recall and destruction of the bibles made the Wicked Bible into a collectors item — on which, if you happen to have one laying around somewhere — is worth in the realm of $100,000. From the Archives: The Oldest Emoticon: It may be a typo. Or it may be awesome. Related: “Just My Typo: From ‘Sinning with the Choir’ to ‘the Untied States’” by Drummond Moir. 4 stars on 39 reviews.